Fall is here and Halloween is approaching. Halloween is a fun-filled holiday for everyone. However, the scary creatures, silly costumes, decorations and treats can be frightening and potentially dangerous for dogs and cats. Even if you’ve found the perfect costume for your pet, they may not enjoy wearing it. Well in advance of Halloween, try the costume on your pet and see how they react. If they don’t like it, don’t force them to wear it. You do not want to cause them discomfort and stress. Some animals don’t mind, but others do not want to be bothered. If your pet’s costume comes with a mask, make sure that the eyes have plenty of room for your pet to see and that the mask does not cover your pet’s ears, nose or mouth. Some pets tolerate masks, but many find it too stressful. Avoid tying anything around your pet’s neck that could cause choking or strangling. Make sure the costume has no small parts or pieces that may be easily chewed off and swallowed. If you are having a party, provide a safe, out of the way place where your pet will not be disturbed. Some pets are friendly and don’t mind loud noises, music or lots of people but for their safety you should keep them in a room with food and water and a toy where they won’t be disturbed during your party. Check on them once in a while to let them know everything is okay. Do not take your dog along for trick-or-treating. Even the best trained dogs can become spooked or aggressive in the noise and confusion of Halloween. If your pet is a cat, remember that some people tend to find Halloween events an excuse to hurt or kill cats, especially if they are black in color. It is best to keep your pets inside for several days before and after Halloween to keep them safe. On Halloween night, keep them in a room separate from the trick-or-treaters. This will help them be less frightened and threatened by constant ringing door bells or noisy children in costumes. Too many strangers can overwhelm a pet. If a pet is let loose in a house, they may dart out the front door as you hand out candy. 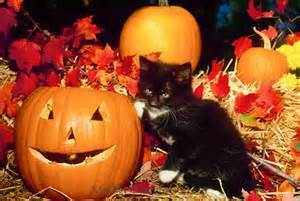 Avoid hazardous decorations such as lighted candles or jack-o-lanterns which can be knocked over by a swinging tail or a curious cat. Not only could your pet start a fire but they could burn themselves. Don’t use streamers or ribbons on your pet’s collars or costumes or for decoration. These items are frequently ingested and may cause intestinal obstruction which requires surgery to remove. Keep Halloween candy out of your pet’s reach. Chocolate is toxic to pets and many candies can be harmful and make your pets sick. Candy wrappers, such as tin foil, can get stuck in your pet’s digestive tract and make them ill or cause death. Avoid giving your pet alcohol or caffeine. Rich fatty foods can cause your pet discomfort and result in a trip to your veterinarian. Pets have an excellent sense of smell so keep all counter tops clean and a lid firmly locked on the garbage can to prevent them from eating wrappers and food packages. For more information on Rexburg animal care, contact Upper Valley Veterinary Clinic at (208) 356-4271. Have a safe and fun Halloween with your pets.